What's meditation and what is it for? How do I switch to meditation mode? How to change my meditation or nature sounds? Can I turn on a few nature sounds at once? 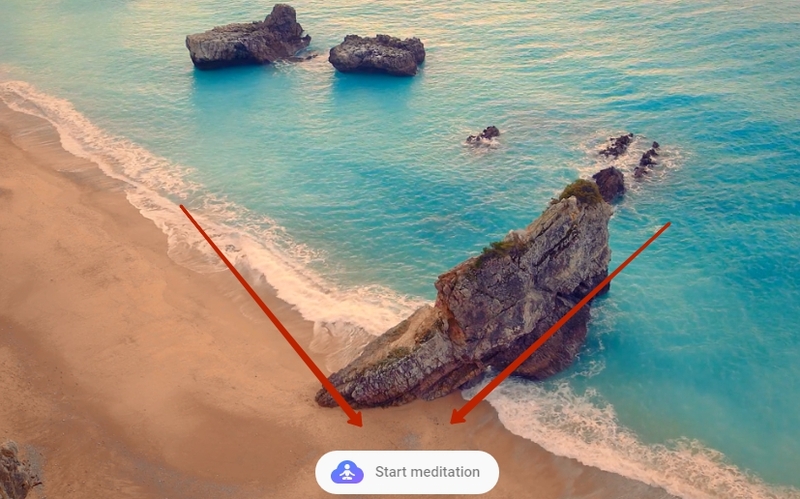 Can I exit meditation mode with the meditation sounds staying on? 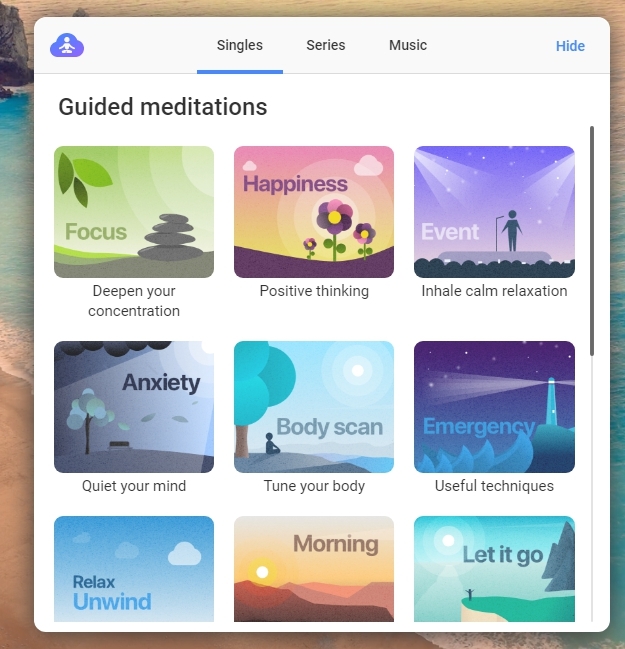 Can I change a theme while in meditation mode? How to stop meditation mode or the sounds? Meditation is an effective relaxation and concentration exercise that frees your mind from unnecessary thoughts and anxieties, calming and bringing the body back in balance. Regular meditation practice improves mood, teaches you to relax and avoid responding to stress, helps you fight bad habits, strengthens the will and character, and improves concentration and memory. Press on the Start meditation button. Singles - single meditations in a great variety of topics. Series - meditation series to improve sleep, get rid of stress etc. A great option if you are serious about meditations and your health. Music - collection of music for relaxation, meditation, sleep improvement etc. If you wish to listen to just nature or animal sounds, please press Hide. 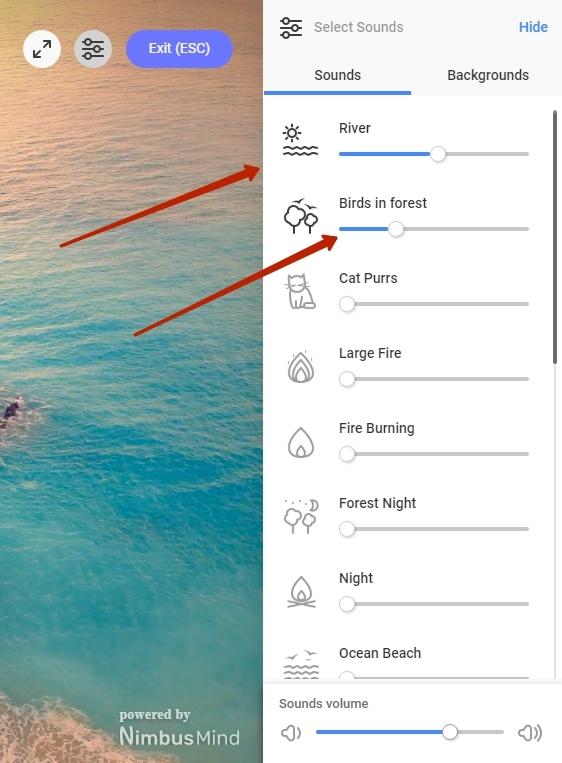 Select background nature or animal sounds using the * button. You only need to set the sounds you want and their volume once - these settings will be remembered for your next time. You can exit the meditation mode by pressing ESC. Just select the one you need and click on it. Yes, just press on the sounds you need. Yes, you can. 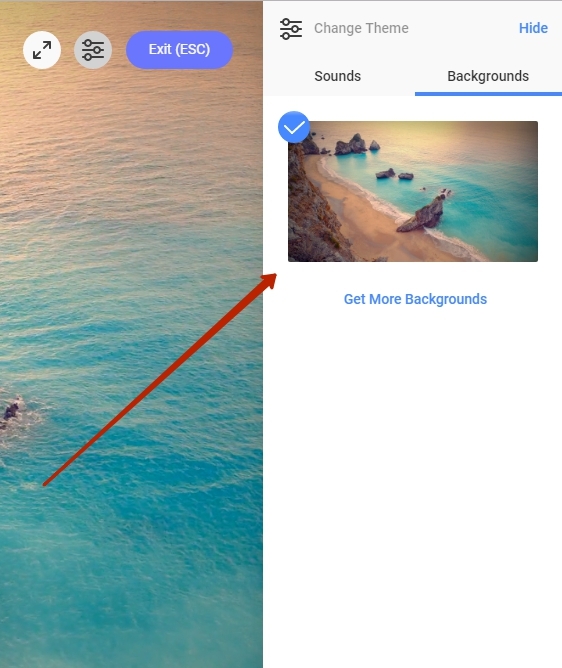 Just press on the arrow and select the theme you need. Press on the space bar or the Stop button.